You can find Part 2 HERE and Part 3 HERE. Thank you. This post was originally created and written in July of 2015. It never made it to publication, despite being completed, due to Part 2 sitting in a state of unfinished limbo. Now, however, I will present to you a piece I have been excited about for a while now. Please, enjoy. The Idol community is an ever-changing platform that will always bring in new fans and see old ones depart to new pastures overtime. For over five years now I have watched the community change along with my own fandom and desires, experienced fans who will come and go along with the changes in the Universe of the Idols. Sometimes, these fans move on to new groups, or maybe even leave this realm altogether. Not everyone stays here forever, you find. It's a community that, though sometimes difficult to be a part of, is one I love and adore, a passion that I am happy to share with others in a variety of ways. My favourite way to share my crazed love for Idols is here, on my blog. For many others, they also enjoy sharing what they love on their own blogs, youtube accounts or tumblr's - it depends on the fan and how you wish to show off your love and dedication to the group you have formed a bond with. Everyone is different. Recently in the community of Idols, I have seen a sudden surge of interest in Idol Blogging come forth from a few of my friends and fellow Idol lovers, and surprisingly, some have even asked for my advice on starting a blog and how to go about it, asking for feedback and wanting to improve on their writing and content that they create. I try to help as much as I can, but honestly, I am no expert in this field - it's just something I love to do, a passion that is fueled from my love of Idols and Writing, however I do want to help people as much as I can if they have an interest in this field and want to pursue it as a pastime. 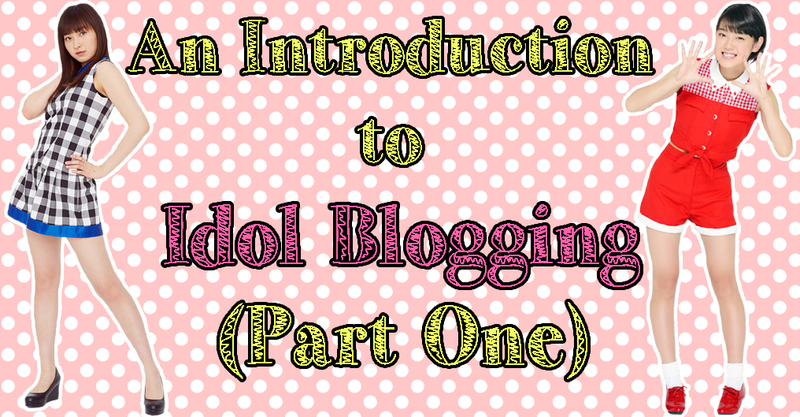 So, because of this surge of interest in Idol Blogging, I have decided to create a small series of posts that will, hopefully, introduce you all to Idol Blogging and try, as much as I can, to help others get into it, as well as to see the benefits of being an Idol Blogger and Lover. Even though I haven't done this as long as others have, I do hope that what I provide you all with will help you all to kick-start your own blogs and to become writers of the Idol Fandom many will follow! So, with all said and done, I think that it is about time to start this post and introduce you all to the charms of Idol Blogging! Are you ready to go? Let's START! One of the hardest things to do when creating a blog is finding a platform that fits you - it's am case of trial and error, really. You may start off somewhere completely different to the blogging space you will eventually end up on, or, if you're lucky enough, you'll find your dream platform right away. Either way, you may want to test out some platforms before conforming completely. My own personal preference is, and always will be, Blogger - some will prefer Wordpress, others may go to tumblr or even Google+, but at the end of the day, the platform is your choice and whatever is easiest for you to use and control. With a platform like Blogger, the layout is simple to control and update, though limited. You can, however, choose your header and make it any size you want, and images are easy to upload and add - that said, Blogger isn't as efficient at keeping the images you may want to return to in order, so you would have to trawl back through old posts to save them once again in order to re-use them. The use of Media on Blogger is also an issue here; Blogger pretty much supports Youtube, and rarely anything else. I have had issues with adding videos from JPopsuki and other video hosting sites in the past, and it's still a hassle even today. That said, Blogger is one of the easiest platforms to start on, because it's quick and easy, and you can personalise it to suit you pretty easily. Wordpress, one of the most popular blogging platforms out there, is definitely a writers platform. Though it is one of the more difficult platforms to use for imagery and creative control, it stores them in order of when they were uploaded, meaning that the image files you had previously used are a lot easier to find. This platform is also great to use if you want to own a blog that relies mostly on the written content as opposed to visual content, and is also a great choice if you want to create a blog with multiple writers instead of one. However, if you want a blog that is easy to change in terms of style, colours and headers, Wordpress is not for you - it has an array of templates and layouts, however it is limited in what you can do creatively, unless you pay for it. I have used Wordpress on many an occasion; blogs such as Idolminded, Selective Hearing and others use the Wordpress platform for writing and creating content to share with people, and though it is not the best platform for imagery, it's great for written content. My main issue with it as a blogger, though, is how restricted it is in how I can personalise my blog and make it my own without having to shell out money for it. That said, it's still a great platform, and easy to start up! Tumblr is one of the more recent platforms, and is already popular with many younger generations thanks to its quick and easy way of liking and sharing posts. Tumblr is definitely a great way to share pictures, ideas and posts, and if your content gains enough circulation, it will continue to be found days, weeks or even months after you first found it. For passing on your hobbies and interests in a quick, easy way, tumblr is actually a very efficient platform. However, the downside to tumblr is that posts can become lost easily, and whilst lengthy posts are available there, it seems to be a platform that relies more on the smaller posts, ones that are reaction worthy, more than anything. My personal outlook on tumblr is that it's not a particularly great blogging platform, so to speak; I am easily overwhelmed by it, and get confused by its layout changes, however there have been people who find success on tumblr and enjoy blogging there frequently. If you want to create lists and share pictures with ease, though, I do think tumblr is a pretty great platform to try that on. Of the few blogging platforms noted here, Google+ is a rather recent, albeit not very popular from what I have seen, way of blogging and sharing your interests. It is one I have yet to use myself, however seems to be a little like Facebook in that you can easily share things on a timeline. Google+ has also been noted for being a platform that some Idols, more-so the 48 collective, will use frequently. Whether this still strikes true or not is beyond me, however, I know that in the past Idols have written on there. Really, though, the most efficient feature of Google+ is that it is linked to a variety of accounts already, such as Youtube, Blogger and your Gmail account. It is also a great place to create communities and interact with others, as well as a way of video chatting with ease. Though Google+ is not my personal preference for a blogging platform at all, as well as it being one I actually do not use for that type of thing anyway, it does seem to be a good way of sharing your future blog with others, as opposed to actually writing there. So, this is more a promotional platform, if anything, which we will get to later on within the series. Finally, I will be listing another personal favourite of mine, and that is the Youtube platform. As a video hosting site, Youtube has become a great place for editors and visual lovers to create content and share with others, and for Idol fans, it is a great place to voice your opinions not through the written word, but by actually recording and saying it. Youtube has a plethora of users who create and share content, whether it is news updates within the Idol world, showing off their Idol collections or even reacting to videos. Though not traditionally a blogging platform, Youtube is definitely one of the biggest places in the blogging and vlogging world to get noticed nowadays, so if you aren't camera shy and want to give your say, Youtube is a pretty good place to be, too! I started vlogging about Idols after I began blogging, and it was a great way to promote both my blog and videos together by adding links to posts or my youtube description box. I have readers who came from youtube, or viewers who actually came from reading this blog, so if you don't mind showing your face on youtube, then it truly is a great way to begin your Idol Blogging/Vlogging career, as well as a good way to promote, too! This is not a complete list of blogging platforms that you could use as a potential Idol Blogger, however these are the most comment to use as of 2013-2015, and some of the most popular and easy to create content on, too. At the end of the day though, it really is up to the writer and how compatible they are with whichever platform they choose to use. Some will use Blogger, others Wordpress - play around with what you can and, eventually, make your choice! It is always important to try before you commit, otherwise you may just end up hating the platform you are using. A lot of the time, the desire to create a blog comes from either one of two things; A desire to write about what you love, or other times, you feel inspired by other blog writers out there. No matter what though, if you're going to start a blog, I want to suggest that you look up other blogs before doing so, merely for the sake of inspiration and research. Looking at other bloggers and the content that they create will give you an idea of what you can bring to the world of Idol Bloggers. Do you want to create lengthy, in-depth Reviews of your favourite singles, or do you want to talk about PV's with their merits and downfalls? Do you want to solely update on News and up-and-coming releases or events? Are you someone who likes posting Ranking lists, showing the world your favourite Idols, or do you want to create posts that focus on pictures and nothing else? If you're still unsure about what you want to do, then it's actually best to see what is already out there, and get an idea of what has been done, and what possibly hasn't. With this research that you undertake, you will begin to see that some blogs actually stick to one format whilst others will have a variety of posts and serials without sticking to one idea. This will also give you some ideas of what is popular, what works, and what doesn't for you - if you like one bloggers idea, such as picture spams or condensed reviews for example, then why not adopt that idea as well, but adapt it to suit your personal tastes and to, above all, fit your divine style. Your inspiration for your blog will come with the research you do, so my suggestion is this: Read as much as you can from other bloggers, and borrow ideas that are readily available. By doing this, you will eventually begin to create content that is divinely yours, because you will have improved and adapted a previous idea that inspired you as a blogger, and helped to bring your blog to life. You will also find that, by looking at other blogs, you may find a certain style of writing or way of blogging that you prefer - some enjoy condensed writing, as minimal as it can get, whilst others will take great pleasure in writing out lengthy, description-heavy posts to get their point across as best they can. No matter what though, reading and research is key, because it all leads to inspiration at the end of the day, so, research away! If you don't know where to look first, then I recommend these blogs to give you an idea of what people write about, the styles they use, and the various kinds of series or formats that they prefer when writing their pieces. Every blog is different, so there will be one out there that will look good to you, so try them out! We have already covered what platforms are out there already, at least a handful of them, so once that has been done and you have found a platform you feel comfortable with after some playing around with themes, layouts, designs and the like, it's time to name it, and truly, that is one of the hardest things to do as a blogger. Why? Simply put, this is the name your blog will become recognised by, as well as how others will come to know you. It's the same with creating your own blogging persona; the name is how people identify you, especially if you aren't showing your face, only your writing and enthusiasm. So, depending on how you want your name to look and sound, finding the right name for your blog can be a difficult process, one which can take far longer to figure out than your theme and layout did (of which we will get to, in another post). Some bloggers name their blogs after a song they like - Janakya Mottainai, for example - whilst others create their titles made up of puns or wordplay. Idolminded and We're Namba 1! are good examples of blog titles that were created through the clever use of wordplay. Still, don't subject yourself to Idol-themed titles or song names if you don't want to; you can go as simple as you like, and it doesn't even need to be Idol related! If you want, it can simply be a random set of numbers, or just a tag line you really like. As long as you like it and think that it fits you, then that is really all that matters. Play around with the titles though, write various ideas down for what you want to call the blog, and even create taglines if you feel inspired to do so. At the end of the day, this is the name you are attaching to a blog that may eventually become a piece of you in the long run, and many will recognise you for it. So, when you choose your title, be sure you are happy with it and want people to know you for it, that is my advice to you all. After this, with a platform and now a named blog, you can do either one of two things; begin designing and planning out how you want your blog to look, or, create your very first post and introduce your blog to the world. Typically, I have found people are more inclined to design their blog first, however some who are itching to write an introductory post will feel it's a tad more necessary to write out something first in order to fully introduce their blog to the world, and complete the process of creating the blog they worked hard to form. Whichever one you choose to do first, designing or the very first post, it is all up to you. It is also your choice in how you want to introduce yourself to the blogging Universe from day 1 of your Blogs life - An introduction post, detailing what you aim to do and any future plans for the blog, or possibly a Top 10 list of your favourite Idols or members from a specific group? Or, maybe, you can make your very first post an angry rant, about how a PV or single didn't befit your tastes. Whatever it is, how you open your blog to others is no ones decision but your own. If you want to rant, then rant! If you want to gush over the Idols you adore and list your favourite members, then gush away and share your excitement! Regardless of how you introduce yourself and your blog though, giving an idea of what your future posts may be like, it will always be a scary experience when you finally publish that post - this is it, you starting a journey with your very own blog, and once it's published, your own little place has truly opened to the world around you. Whether it is your very first blog or your fiftieth, creating, editing and publishing the very first post there will always be an exhilarating and frightening point of your life, because you don't know what will happen. Who will read it? Will they like it, or maybe even hate it? What if no one reads it? Worst of all, what if this is just the start of a one-post blog, one that you may never return to because it isn't all it cracked up to be? All of these things you may think about when creating that very first post, but honestly, the worst that can happen in the Idol Blogging world is a stupid flame comment, or that you yourself don't feel like a good enough writer. The thing is, if you have ever created a post and delivered your opinion or expressed your love for an Idol you have adored, past or present, then you have shared your love for the world of Idols, one way or another. Even if your Idol blogging experience does not last even after this trial period, what I can say is this: You created something, and you tried, but please, don't think that you aren't a good enough writer based on how little you have written, or how much you have written but don't get the recognition you would like for it. The fact that you have produced something and shared it to the world shows just how much you love Idols, and that you were brave enough to make that first big post. It is always worth it. I thank those who have read this post for making it to this point, and I hope that this first article within this small series will have helped someone, even if it is only just a little bit. Honestly speaking, I am not the sort of person who thinks that I am good at giving advice, nor do I believe that I am the best person to be doing this sort of thing, however after receiving requests for help with blogging and how to start from various friends and fans of Idols, I thought that this would be a useful post to do, and one that would be beneficial to readers who wish to start out in Idol blogging. I can only hope that this was even a little informative on your end, and that you have taken something from it. I am not an expert blogger by any means, however I have my own experiences from these past five years that I want to put into this series, and I will try my best to help others who wish to take the journey into blogging. It is something I am passionate about, and if I can help others become just as passionate about Idols and writing too, then I will work my hardest on this series in order to aid new writers in creating their content, and becoming amazing bloggers for the future! Give blogging a chance, and introduce yourself to the world of Idol Blogging. Become the future, and keep the passion of Idols sizzling for future generations of Idol fans! Until next time, where I hope to see you all in Part 2, please take care, and love Idols! I hope Part 2 deals with many of the perils and pitfalls to watch out for when becoming a celebrity idol blogger: How to keep from falling down the rabbit hole of alcohol, drug and collectors addiction. How to resist compromising one's journalistic integrity by trading glowing reviews for backstage access. How not to give in to the dark temptation of translating the lyrics. How much cake day cake is too much cake day caaaaake. Thank you for this uncompromising look at the behind the scenes of how the idol blogging sausage is made, Chiima! Being an Idol Blogger is truly hard work, indeed! Though I don't talk about the outside stuff like all that alcohol and the stress it induces :p Collectors addiction though... I may have to talk about that haha!